Our service engineers are fully trained, qualified and WRAS approved. (Water Regulation Advisory Scheme) and will take control of the installation and maintenance of your machine from the start, leaving you with complete peace of mind that your cooler is in perfect working order and dispensing the highest quality spring water. We are also accredited by the Safecontractor scheme - demonstrating our commitment to health & safety. You can find out more about our Accreditations by visiting our Training & Accreditations page. We want the installation of our water coolers to be as straightforward and as simple as possible. Our range of high quality bottled coolers are easy to install, simply plug them in and you'll have perfectly chilled water in seconds. When installing a mains fed dispenser and working with your water supply, our engineers will ensure the correct fittings are used and the right pipework is accessed, ensuring a high quality installation that protects your employees' and visitors' health and safety. Regular servicing and maintenance safeguards the hygiene of the water we supply and the health and safety of those drinking it. It's also vital in maintaining the operation of the machine and most importantly can prevent breakdowns, repairs and down time. 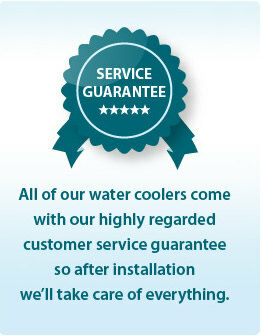 All of our bottled water coolers come with our highly regarded customer service guarantee so after installation we'll take care of everything. You don't have to remember when your cooler is due to be serviced, our customer services team will do that for you and automatically arrange for one of our fully qualified engineers to conduct a service inspection when it's due. Our bottled coolers are serviced 4 times a year, the machines are thoroughly cleaned and serviced at each visit, with all servicing included in your monthly price package. 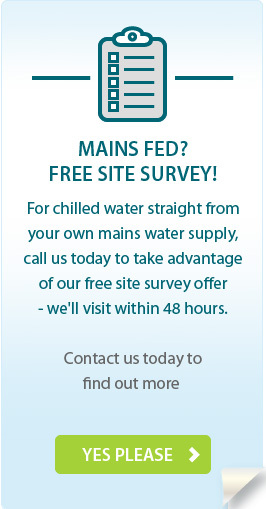 Customers opting for a mains fed cooler are entitled to the same great level of service. We will ensure your dispenser is perfect for your location by conducting a free site survey at your premises prior to installation, which will be arranged by our sales team at a time and date to suit you. We'll carry out a full comprehensive service of your machine twice a year which is included in your price package. We are confident that the water coolers that we supply whether bottled or mains fed are the highest quality on the market and therefore with regular servicing and maintenance would not expect any unforeseen issues with their operation. There are always however, exceptions to that rule. Customers experiencing any problems can contact our customer services team at any time to ask for advice or report a problem and we will be happy to help. If required we will arrange for an engineer visit to remedy the problem and undertake any necessary repairs which would be included in the rental agreement. Click the links on the right for further information about our accreditors.